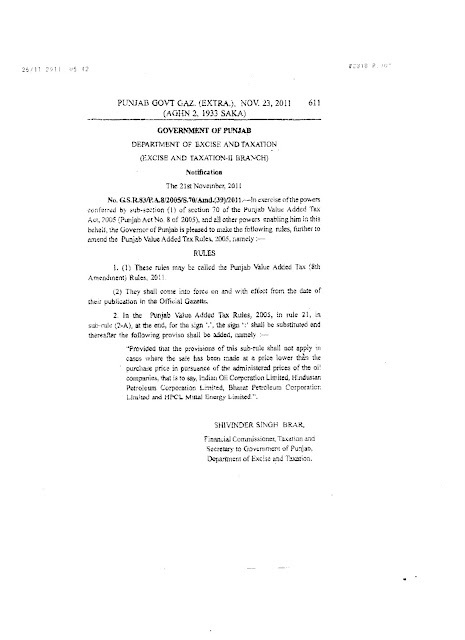 Rule 21 of Punjab VAT Rules 2005 has been amended so as to provide a new proviso to Rule 21(2-A) which provides that input tax credit will not be reversed by the taxable person where the sale is effected at lower price than the purchase price in pursuance of the administered prices of oil companies, that is to say Indian Oil Corporation, BPCL, HPCL and HPCL Mittal Energy limited. It should be noted here that sub-rule (2-A) to Rule 21 of PVAT Rules was added last year w.e.f 29-11-2010 which provides for disallowance of Input Tax Credit to a taxable person to the extent of tax payable on the resale value of goods or sale of manufactured/processed goods where such goods are sold by a taxable person at a price lower than Purchase price or manufacturing/procesing cost of such goods as the case may be. It is also notable here that the prices of petrol were decreased by oil companies some days back as a result of which the said proviso to Rule 21(2-A) have appeared to been added. The retail outlets of oil companies are not required to calculate input or output tax on petrol and diesel as per the order of Commissioner u/s 85 of PVAT Act, 2005, which makes provisions of rule 21(2-A) ineffective for retail outlets in case the prices of petrol and diesel decreases. Thus the said proviso has been rightly added to cover up the above situation.